As time passes I have discovered that I love to try new things. This is new for me as prior to the starting of this blog I had not been someone who was open to trying new items. I am very proud to say that I now not only try different items, but I actively seek out these opportunities to try something new. I have discovered many wonderfully yummy items and I look forward to each opportunity to sample these items. 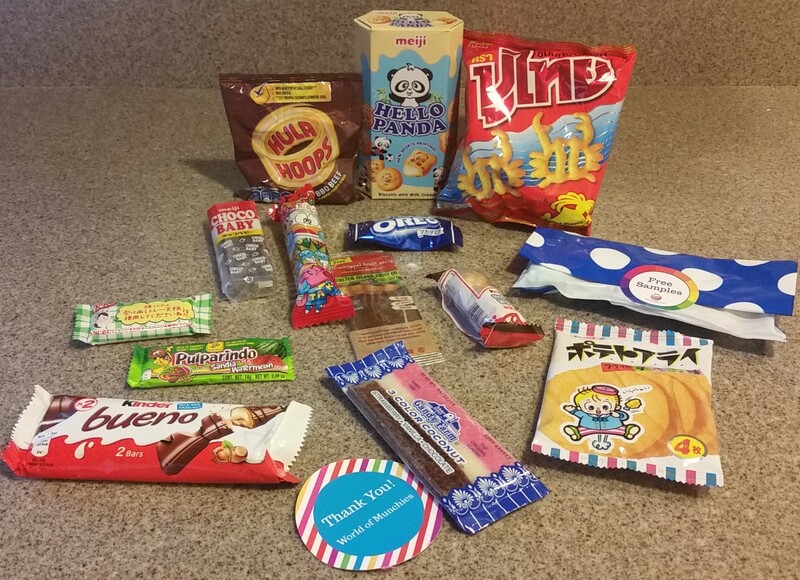 I have had the opportunity in the past to review previous World of Munchies boxes, they are the perfect way to sample international snacks and sweets without the commitment. One of the offerings of boxes that they have is called the Snack Attack box. Each Snack Attack box you will receive 7-9 items in each box, selected from various international snacks. New products are being added often, which means that each box will be a random sampling of the snacks. This entry was posted in Food and Drink Products, Giveaways, Monthly Subscription Boxes, Reviews and tagged aroundtheworld, candy, giveaway, giveaways, international snacks, kosher, snacks, Subscription Boxes on July 6, 2016 by Jennifer. I have mentioned in previous posts that we are a snack house so when I was given the opportunity to give away a World of Munchies box I was excited! This entry was posted in Food and Drink Products, Giveaways, Monthly Subscription Boxes and tagged aroundtheworld, candy, international snacks, snacks, Subscription Boxes on May 8, 2016 by Jennifer. As time passes I have noticed that my taste buds are not what they one were. I tend to run trains on items. Let me explain further – I will get a snack in my head, act as though it is a 5 alarm fire to procure this item, I will then eat only this snack for the next 4 to 6 weeks. As quick as this occurs, the opposite also is true, I get tired of the item almost as quick. This makes life for Jason a little on the frustrated side. Try as I might to lessen his frustration, I am usually unsuccessful therefore leaving him with fewer snack options than he might prefer. The one thing he always does is encourage me to try new snacks. I am proud to say that with the creation and execution of this blog that is exactly what I have begun doing. I have had the opportunity in the past to review previous World of Munchies boxes, as they are the perfect way to sample new snacks without the commitment. One of the offerings of boxes that they have is called the Sweet Tooth box. Each Sweet Tooth box you will receive 7-9 items in each box, selected from various international snacks that you may know and may love. The most amazing thing about World of Munchies is was started by the mind of an 11-year-old entrepreneur. This entry was posted in Food and Drink Products, Giveaways, Monthly Subscription Boxes, Reviews and tagged candy, chocolate, giveaways, international snacks, Monthly Subscription Boxes, Reviews on February 28, 2016 by Jennifer. When I was just over 30 years old, I had the opportunity to travel overseas and go to Thailand. I was young, and it was my first time being an entire ocean away that was separating me and my loved ones. It just so happens that I went a mere 5 months after the tsunami hit, that was triggered by the Indian Ocean earthquake. While I never traveled to the tsunami zone, there were plenty of other beaches and coast line’s in Northern Thailand that could have fallen victim. I remember being thanked for traveling to Thailand many times over. On my first night in Thailand after hotel check in, my travel mates and I decided to do two things: the first was watch the traffic on the busy Bangkok streets and the second was to visit the first convenience store we had any recognition of. Apparently traffic laws are much more lax in Bangkok and despite being on the sidewalk, we were almost hit numerous times. Also, as luck would have it, the corner we were on happened to have a convenience store with the green and red coloring we all knew so well. I decided to take this chance and purchase some treats and I knew. I discovered many treats that trip that had I not tried them, I would have missed out. Since then, I am always on the lookout for new and interesting boxes and I think I have hit the nail on the head with my latest box find – World of Munchies. World of Munchies was started by the mind of an 11-year-old entrepreneur. I can say when you see the selection and diversity of the snacks included, they are not of an 11 year old palate. This entry was posted in Food and Drink Products, Giveaways, Monthly Subscription Boxes, Reviews and tagged aroundtheworld, candy, international snacks, snacks, Subscription Boxes on December 6, 2015 by Jennifer.